Blast Radius is a book it has taken me along time to get around to reading, mostly because I misunderstood what it was about and didn’t think I would enjoy it. I was wrong on both counts. I thought it was about a soldier in Afghanistan but in fact, it’s about an ex-Royal Marine’s experiences when he come home from the conflict. Sean’s best friend Mitch saved his life in Afghanistan but in doing so, lost his own. Now back home living with his older sister in a Midlothian town, Sean is finding it hard to cope with everyday living and is ‘haunted’ by the voice of Mitch who chatters incessantly in Sean’s deaf ear. The book follows Sean’s experiences as he tries to cope with adjusting to civilian life, holding down a job and beginning to form new relationships. A blast radius is defined as the area affected by an explosion, not just the immediate area where it takes places but the outlying area also affected. 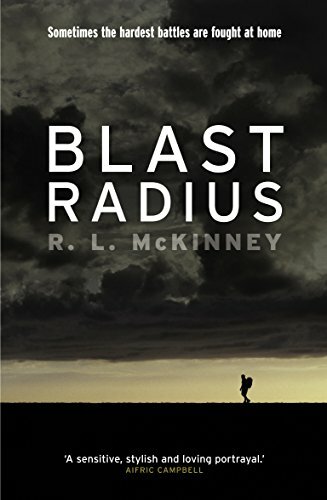 This makes Blast Radius a perfect title for the book as it looks not just as the immediate physical effects when Sean was caught up in the explosion but also the way those effects rippled out into his life. His character is so well depicted that I felt I could really empathise with what he was going through. It is hard to imagine seeing the things members of the forces must see and not being affected by them. And veterans will be affected and respond in different ways. By using a first person voice I felt that I was right there in Sean’s head, experiencing the same fears and confusion, his demons if you like, but ultimately also the hope that he feels. It was interesting to read about how Sean felt when people asked about his experiences in war. They often asked in quite insensitive ways, even if it was well-meaning, but no-one really knew what it was like to be Sean. Blast Radius is a very moving and sensitive story which, I feel, gives a perceptive account of what it might be like to live with PTSD. Rebecca McKinney deals with a difficult subject with real insight and has written a really powerful novel about grief, guilt and hope. I found out recently that an estimated 1 in 6 of Scotland’s population are forces veterans. When you take into account their families, that number rises to 1 in 10. So Sean’s experience is not going to be unique and among those veterans, many will be coping with PTSD. I was really struck with how well the author wrote about Sean’s feelings and asked her if she would write a piece about how she researched post traumatic stress disorder and its effects. I’m pleased to say she agreed and you can read about her research below. Thank you so much for doing this and so quickly as well Rebecca! The question I have been asked most about my novel, Blast Radius, is how I managed to get inside the head of my narrator, Sean. It’s an understandable question. Sean is an ex-Royal Marine who has come back to Scotland, carrying the ghosts of his experiences in Afghanistan with him. In other words he is, in many ways, about as different from me as it is possible to get. Despite this, I chose to write in the first person, present tense because I felt it was the best way to create a sense of intimacy with Sean. The book opens up his head and picks over its contents: anxieties, nightmares, hopes and memories. So how did I get into Sean’s head? The best answer to that is empathy. Empathy is the ability to share the feelings of another person. To be empathic with another person doesn’t require you to have had the same experiences as they have. However, it does demand that you have the ability to imagine how you might react if you did. To write the kind of characters I like—those who stick around after you’ve finished the book and give some new insight into the world—empathy and imagination are the most fundamental tools. I think it helps to have some varied and gritty life experience under your belt too. I’ve also been reading about war and what it does to people since I was a teenager. I read All Quiet on the Western Front when I was fourteen, and it blew my mind. That started me down a reading path that led eventually to Blast Radius. Pat Barker’s Regeneration Trilogy and journalist Michael Herr’s stunning account of Vietnam, Dispatches, are just two of the most memorable books I’ve read along the way. As I was writing Blast Radius, I also read many articles and personal accounts about Post Traumatic Stress Disorder. I don’t like calling it a disorder at all, because it implies that it is somehow wrong to be traumatised by war or other violent events. As Sean says in the book, ‘the only people who aren’t damaged by it are the psychopaths.’ This is not to say that everyone who goes to war comes home with PTSD. However, it is impossible to know what hidden damage is inflicted and how or when it will appear. Symptoms often only appear years after the fact, which is one of the reasons why many veterans, like Sean, receive so little support. Relatives, friends and acquaintances of mine have also been to war and come home. Some talk openly of their experiences, but mostly they don’t. They just get on with whatever life has in store next. This is what Sean has to find a way to do, so while the reader gets to hear about what he’s been through, the people around him don’t. He isn’t met with a heroic reception, or by a loving wife. Instead, he lands back in a place he never wanted to see again. He moves in with his half-sister, in a town partially inspired by Bonnyrigg, where I live. He gets a job driving a van for a social enterprise that sells second-hand furniture. In my day job, I work with social enterprises and charities, so the setting was real and immediate to me. I wanted this to be Sean’s route back, both into civilian life and—through the people he meets along the way— into his own past. I wanted him to realise that the people around him are also fighting their own unique battles. I wanted him to find friendship and humour. Most of all, I wanted him to find enough hope to keep living. In this final regard, he has something in common with the characters of my second novel, The Angel in the Stone, to be published by Sandstone Press in August. Sean McNicol’s best friend Mitch saved his life in Afghanistan, in an act of impulsive heroism. Now Mitch is dead and Sean has left the Royal Marines with a head full of ghosts and guilt. Mitch talks to Sean from beyond the grave, by turns encouraging him, cursing, singing and leading him to question his own sanity on a daily basis.Turning his back on his life as a soldier, Sean grudgingly returns to the downcast Scottish town of his childhood and takes a job moving second-hand furniture for the Once Loved Furniture Company. He is hired by a former schoolmate to clear her late father’s house at Cauldhill Farm, and gradually discovers that his own life is intertwined in the most unexpected way with the farm and its former occupants. In order to find the thing he wants most- a bit of peace- Sean must confront the unquiet spirits of his past: his alcoholic mother, his absent father, his old (almost) girlfriend Paula, his own fatal mistakes in Afghanistan and, of course, Mitch. I loved this book Joanne. Looking forward to the new one.